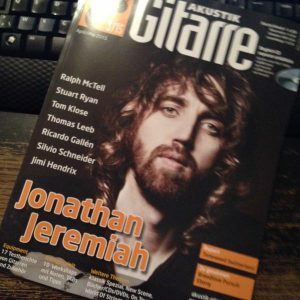 Stuart Featured in Akustik Gitarre and Calibre Magazines! In addition to his regular work for Guitar Techniques and Guitarist Presents Acoustic magazines Stuart has also recently been a featured artist in Germany’s Akustik Gitarre magazine and Calibre, a men’s lifestyle magazine. You can check out the articles below! ‘The Way Home’ – now on iTunes! I’m delighted to announce that my new solo fingerstyle album, ‘The Way Home’, is now available on iTunes. CD copies are also being printed soon and if you’d like to reserve one of the first copies please don’t hesitate to get in touch via the Contact page. I have some solo dates coming up in London soon, would be great to see you at one of these if you can make it! The Tradition – Now available on iPad! The latest edition of Akustik Magazine features my arrangement of ‘Planxty Irwin’, this is a slightly different arrangement from the version found in ‘The Tradition’. Downloadable HD Video lessons on the way! I’ve had a number of requests for downloadable HD video lessons to be added to the store so I’ve started working on the first series! I’m really excited about this and have been hard at work in my home filming studio. The first set of lessons are designed to follow on from my current book/CD ‘The Tradition’ so I’ll be teaching new solo fingerstyle guitar arrangements of some of the most beautiful melodies from Ireland, Scotland and beyond. I finished filming the first lesson today and will be editing soon – in this lesson I’ll be teaching three airs. The video should be available for download next week and will be a 30 – 40 minute lesson with pdf tab/notation to accompany it. Look out for Guitar Techniques issue 243 which features my transcription and recording of Steve Howe’s famous solo fingerstyle guitar piece ‘Clap’. This one’s great for those of you who fancy a fingerpicking challenge! Free “20 Essential Blues Guitar Intros” tab and backing tracks! We’ve been overwhelmed with the response to our new sister site www.bluesguitaruniverse.com and have just uploaded a new free lesson download – “20 Essential Blues Guitar Intros”. Just click the link above, enter your e-mail address and you’ll receive a free zip file containing the tab in pdf format and all the audio. Enjoy!